Browsing the latest list of Suffolk FADA nominations while lunching in what rightly emerged as the Best Cafe, G&T's, we discovered a category entitled "family dining". FADA website, a bit rubbish, had only the names with no accompanying links or locations, which left us pondering what and where these places might be. I'm off to Newmarket on Sunday morning, said that Andy. 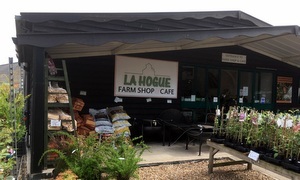 How's about we do breakfast at La Hogue? Which is what we did once we'd lugged an old eBayed six foot sideboard upstairs to its new home. About 10 minutes from Newmarket close to the confluence of the A14 and A11 is "your local farm shop and cafe". We arrived around 10:15am, not long after opening time, and that car park was filling up. Shop is a cross between Suffolk Food Hall and Wyevale and leads through to the capaciously classy caff. Chop chop busy busy in there, the well-heeled of Ely chowing down on home-cooked English breakfasts. Andy ordered while I grabbed a table. There's outdoor seating plus a separate area seemingly designated as a quiet zone, presumably free of screaming brats. Bit weird? I was lucky to land the last of the morning's specials, a rather fine combo of eggs, potato and bacon, while the driver settled for the regular breakfast. Stacks of stuff on the menu from salad to scampi to soup to sandwiches. Much like the similar-ish farmcafe, there's stacks of Stokes, always a good sign. None the wiser about that name and a bit out of the way for us over here in the far east but worth a trip. If it was a car -- Venturi Eclectic. If they were passing by -- Dan Snow.